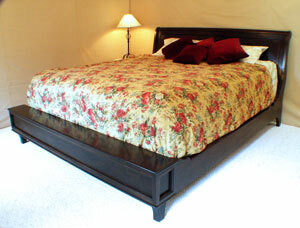 _Beautiful solid Black Walnut bed with paneled head board and low foot board. Shown in King. We absolutely adore our Riverside bed. Elegant and sophisticated, it's the epitome of today's passion for great style. The Riverside Bed is the ideal focal point around which to create your dream bedroom.